We did it, a week ago today our little team set out to take on the national three peaks 24 hour Challenge. The challenge is to hike the highest mountain in Scotland (Ben Nevis), England (Scafell Pike) and Wales (Snowdon) within 24 hours. 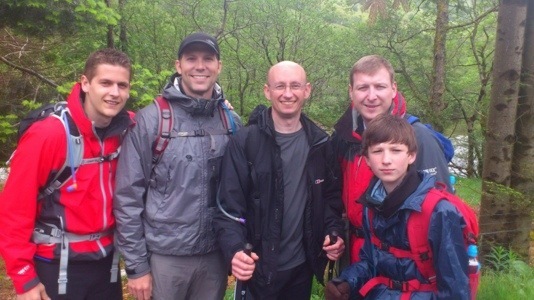 Our challenge began at 16:47 on Thursday 31st May when Steve our dedicated driver pushed us out of the car and onto the trail head by the Youth Hostel at the base of Ben Nevis. This meant that we would need to have scaled Nevis, driven down to the lake district, scaled Scafell Pike, got back into the car, driven to North Wales, scaled Snowdon and be back at the car before 16:47 on Friday 1st June. We set off at high tempo and with clearing skies and lifting cloud made it to the top of Ben Nevis (sadly still shrouded in cloud and a bit of snow) at 19:16. We had enough time to snap a couple of photographs to prove we had made it before heading off back down the zig-zagging but well defined trail that led back to the youth hostel and the waiting car. Around 2115 we had made it back, just shy of 4.5 hours since we started. Within 10 minutes we were on the road and leaving fort William and Scotland behind us as we headed into the night and towards the lake district. Despite a close encounter with a herd of deer darting across the road just a few miles south of Fort William we arrived safely at a very eery Wastwater at 2.15am tired but refuelled and began kitting up, clean socks, warm clothing, head torches, water packs. We set off from the Wasdale campsite and started immediately upwards along the river bed and up to what became for us the infamous Brown Tongue. A steep incline raising up between the forks in the river. It seemed to go on forever and how we missed the clearly defined path of the earlier walk on Nevis. This was our most challenging aspect of the 24 hours, in the early hours of the morning, trudging up steep gradients hacking around for the path, in low visibility not just because of the dark but also as a result of the low mist and cloud. We had hoped to be on the top of Scafell Pike by 4.30am but we had only made it beyond Hollow Stones and onto the ridge by that time. Through a concerted effort we made it to the top by 4.47am exactly 12 hours after we had begun our challenge. Relived to be at the top and halfway through, we began our descent. Our plan had always been to walk out via Seathwaite which meant we were a little closer to the motorway for our journey south and also to have variety on the path. This route meant a scramble over Broad Crag and skirting along Ill Crag before heading north down to Seathwaite. This route was definitely kinder on the knees but took us a little longer than we hoped for. With no mobile reception we were unable to let Steve know we were running late and arrived at the farmhouse at 7.35am an hour later than planned. Steve had left to find mobile reception to pick up any messages we had left. Within 20 minutes or so he was back at the hamlet and we were packed up and on the road again just after 8am. Two mountains completed with one left to do. After a slightly circuitous route through north Wales we arrived at Pen Y Pass at 12.15pm. We knew that time was running a little tight as legs were feeling heavy and that we would need most of the 4.5 hours we had left to complete Snowdon. Our chosen route up the mountain was via the Pyg track with return via the miners track. Leaving at 12.34pm we reached the top amid a large crowd of visitors who had just got off the train that had arrived a few minutes before we reached the summit. With only enough time to take a picture we headed straight back down, by this time legs were very tired and the descent was painful and slow but with 40 minutes to go we rounded the last bend and saw the car park and van parked up. Ian and Scott decided to race it to the end and ran the last 100m at full sprint crossing the finish within our target time. 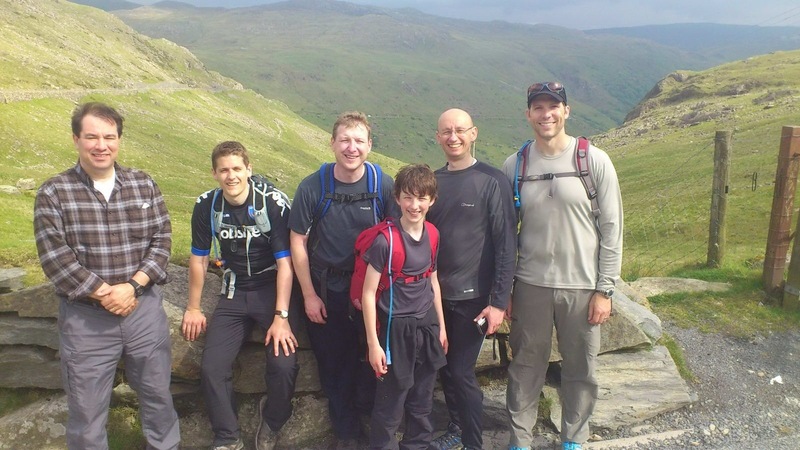 Previous Previous post: One of 5 reasons to do the national 3 Peaks Challenge.